The NorthSide Festival may get a show from him as well. Pictures of new Frank Ocean merch have popped up on Twitter. Check them out via Pitchfork. The photos were taken at the NorthSide Festival in Aarhus, Denmark, where the artist is scheduled to perform today at 5:15 p.m. EST. The new drop appears to include new tee designs based around the font and cover art of his Blonde album. The shirts and merch booth itself read "Blonded," perhaps a reference to Ocean's show on Apple Music. 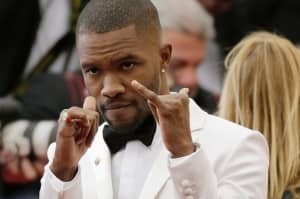 Frank Ocean has cancelled appearances at several festivals this year, including Sasquatch, Primavera, and Hangout Fest. Each time he cited "production delays beyond his control" as the reason for his cancellation.